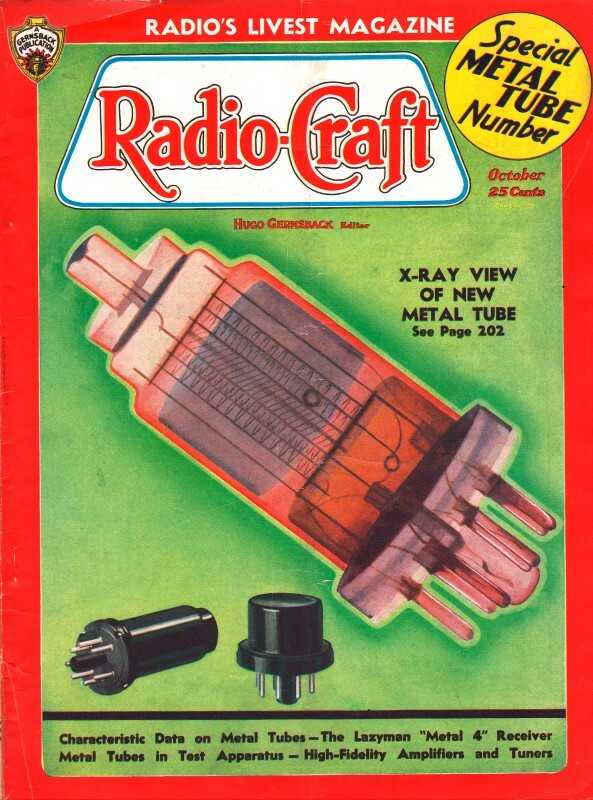 Metal-encased vacuum tubes were such a big deal when they arrived on the scene in the mid 1930s that two successive issues of Radio-Craft (October and November 1935) devoted the majority of print space to them. Metal tubes, as admitted by editor and author Hugo Gernsback, did not perform as well electrically as glass tubes yet, but that was attributed to the infancy of the technology. Overwhelming positives, including ruggedness, lower cost of production, longevity (lifetime) and other aspects would ensure that metal tubes "are here to stay." They never did even come close to replacing glass tubes. One of the most interesting statements in the article has nothing to do with metal tubes, but Mr. Gernsback's understanding of special relativity; to wit, "...unless you have Einsteinian faculties that enable you to look around corners." In 1935, a mere three decades after Einstein published is theory, very few people had even heard of the phenomenon. Radio vacuum tubes (triodes) started out originally as simple round glass bulbs containing three elements - filament, grid and plate. These first tubes, of the vintage of 1907, were produced by Dr. Lee DeForest. At that time there was no such thing as a base and socket; four wires simply were led through the glass envelope and were insulated by differently-colored fabric sleeves. That was the birth of the vacuum tube. Soon, tubes became a bit more finished and a metallic base was added. Later, during early attempts to standardize the tube this base, which really was nothing but a metallic sleeve cemented to the glass envelope, gave way to a composition "sleeve" or base. Meanwhile, the tube was becoming more complex. In the original vacuum tube there was very little metal within the envelope, whereas in the modern, more complex tubes, containing as many as five grids, special plates, screen-grids, caps, etc., the weight of metal (which increased by leaps and bounds) is considerably greater than that of the glass envelope. While the "glass" type of tube reached a very high standard of uniformity in production due to automatic machinery, radio engineers have always felt that the process could be still further improved upon by entirely doing away with the glass. While the breakage of glass tubes in transit was not an important factor, there still was considerable breakage due to handling. There was also a factor of microscopic cracks in the glass which often made the tubes useless after a short period of use. Finally, the glass tube was thought of as taking up too much space in the modern sets. Several years ago, an English company started to manufacture wholly metallic tubes in which practically no glass was used except in connection with certain parts of the sealing (Radio-Craft, August 1933). Unfortunately these tubes were not properly engineered and they did not come into general use. The idea, however, had been watched very carefully by American engineers. They, in turn, improved upon the original English metallic tube and invented an entirely new sealing-off process which involved the use of small minute glass beads - the only form in which glass is used in the American type of "all-metal" tube. The American tube it is believed has been better engineered, and a new welding process has been developed whereby the all-metal tube becomes a tremendously strong article which should not suffer from breakage, and which should last for a long while. Many questions have arisen, not only in the radio trade, but among laymen as well, in connection with all-metal tubes, and it might be well here to state our viewpoint on some of the major questions. Are Metal Tubes Here To Stay? It is our belief that the metal tube is here to stay. It is a major cycle in the advance of radio; and, while revolutionary in many respects, it reflects the trend of the machine age, mass production, and efficiency. The metal tube is here to stay because in time it will be possible to manufacture these tubes by means of new machinery, invented specially in connection with these tubes, at much less cost to the ultimate consumer. Are Metal Tubes Better Than Glass Tubes? When it comes to actual working, that is, radio performance, it is believed that the new metal tubes are not, at the present time, superior to glass tubes - but they are not supposed to be! Do not forget that metal tubes are in their infancy. It will take a little time before they prove themselves to be more efficient than glass tubes. That time, however, will rapidly arrive. In electrical efficiency metal tubes are now about on a par with glass tubes, but they have mechanical advantages not inherent in glass tubes. Will Metal Tubes Last Longer Than Glass Tubes? In the very nature of their design, metal tubes will last longer than glass tubes. They will, therefore, be more economical than the older type. "Have you tried to replace a tube in a set these days - and who hasn't? Unless you are a magician or are equipped with X-ray eyes; or unless you have Einsteinian faculties that enable you to look around corners, it is next to impossible to put a tube in a socket these days. "Eventually the tube and set manufacturers will get together again and do something about it, so you can place a tube in a socket without running a temperature, and without cursing tube and set manufacturers." I am happy to say that, after several years, this objection has been overcome. The new metal tubes have a keying pin whereby it becomes, by contrast, a pleasure to put the tube in the socket. The new metallic tubes take a great deal less room than the glass tubes, and some of the new tubes are so small that it becomes possible to build much more compact sets (for certain special purposes) than ever before. A number of people still bring up the argument that you cannot see inside a metallic tube to determine whether it is functioning. This argument holds no water either, because you have only to touch the tube with your finger; if it is warm, it is functioning. You do not have to see whether or not the filament is glowing. Remember that the metal tube is new. I have no doubt at all that endless advances will be made in the development of the metallic tube, just as tremendous advances were made in the design of the glass tube before it reached its present peak. Give the metal tube a chance and watch it grow. Three years from now we will wonder why we ever bothered with glass tubes that had to be handled with kid gloves, and which future radio historians will wonder at on account of their many shortcomings!